For years, a dog named Tchimi lived the good life. 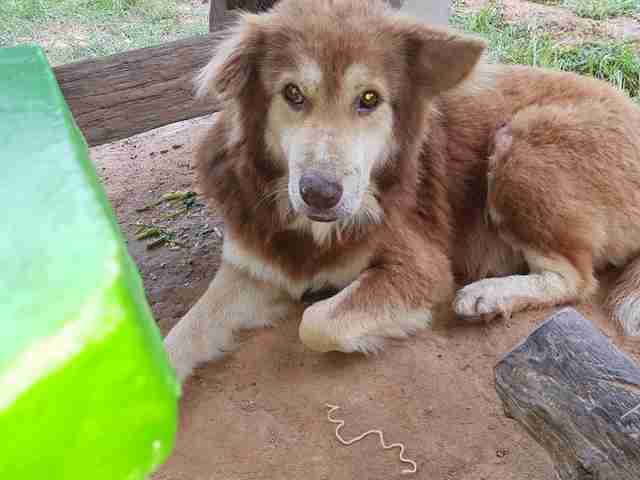 When his owner, an American man, moved to Thailand to get married, Tchimi went with him. For several years, the three of them shared a house, and Tchimi got two meals a day and had a nice dog bed to sleep in. But when the couple got divorced, the man immediately went back to the U.S. — and he didn’t take Tchimi with him. The Thai woman also didn’t take Tchimi when she returned to her hometown in another part of the country. A neighbor felt bad for Tchimi, and she occasionally put food out for him. However, he didn’t always get to eat it as other stray dogs would fight him for it. 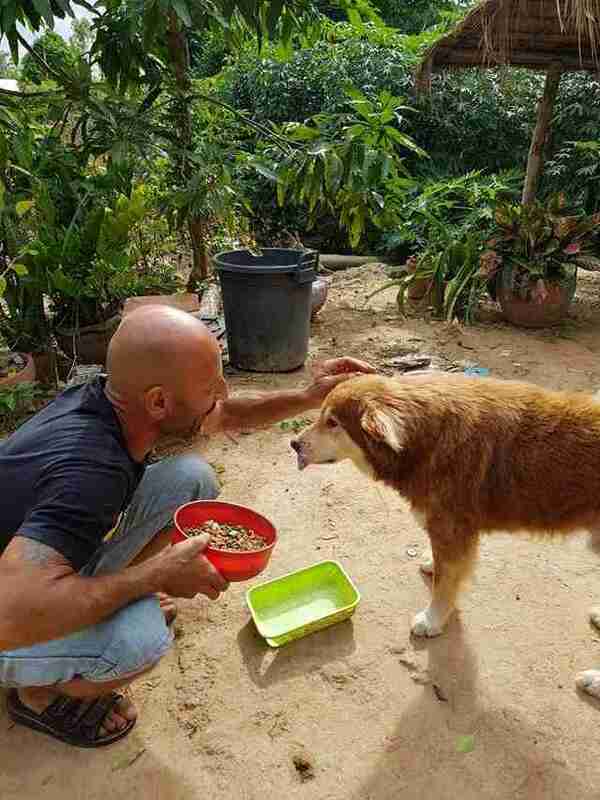 The neighbor knew about Chour, who feeds and cares for about 500 dogs each day, and she asked if he could do something for Tchimi. 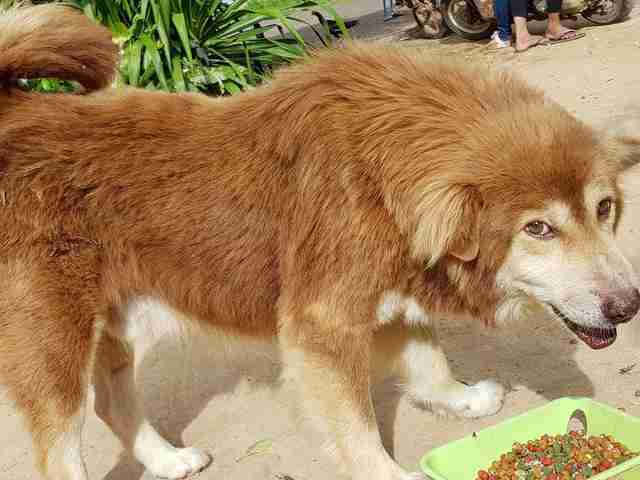 Chour also thinks other street dogs frequently attacked Tchimi — not just for food, but over territory as well. And this would have traumatized the poor dog. He lost trust for everyone — even Chour, who was eager to help him. In fact, the first time Chour approached Tchimi, he tried to bite him. But Chour was patient — he sat near Tchimi for two hours, and his persistence paid off. Tchimi eventually approached Chour and ate the food he offered him. 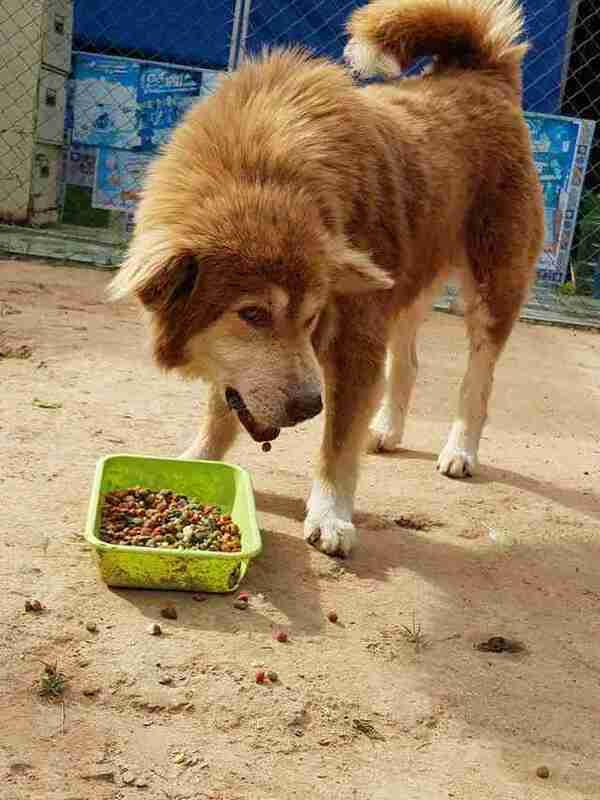 Chour also gave Tchimi some antibiotic medication in a hotdog. But when Chour tried to touch Tchimi, the dog backed away. Chour kept visiting Tchimi every day to feed him and to spend time with him. 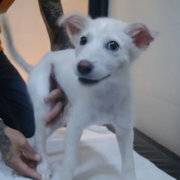 A week later, Chour had found Tchimi a foster home. The foster home was about 2 miles away. Tchimi still hadn’t let Chour touch him, so instead of trying to put a leash and collar on Tchimi, Chour coaxed Tchimi to follow him. “I just called out to him and he followed me … stopping sometimes as if he was asking himself if it was a good idea to trust me,” Chour said. Tchimi was also wary of his foster parents, and didn’t let them touch him, although Tchimi got along with their other dog, Poumpouille. 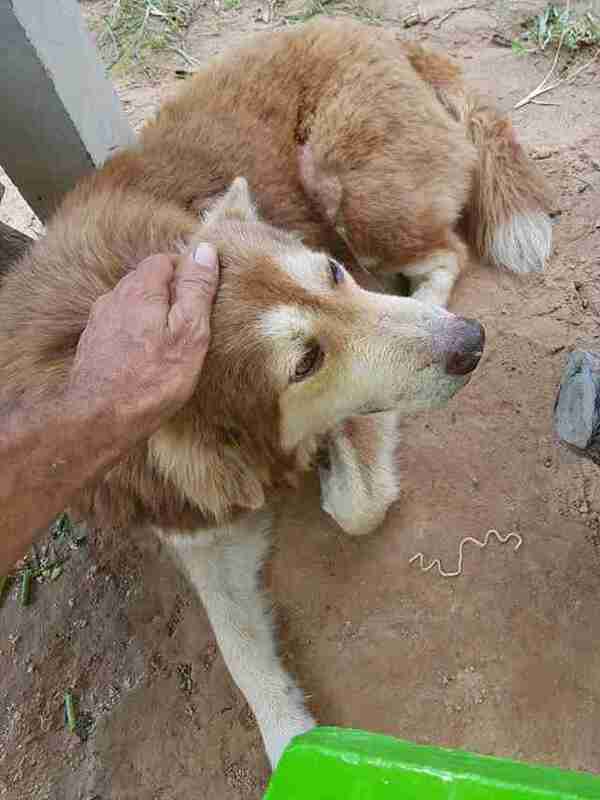 Chour continued to visit each day to feed Tchimi and give him any necessary medical care. After about three weeks of doing this, Tchimi finally warmed up. After this breakthrough, it seemed that Tchimi couldn’t get enough of Chour. He always wanted to be close to him. Tchimi still lives with his foster family, although Chour hopes to build a dog shelter at his own home, and eventually move Tchimi there. 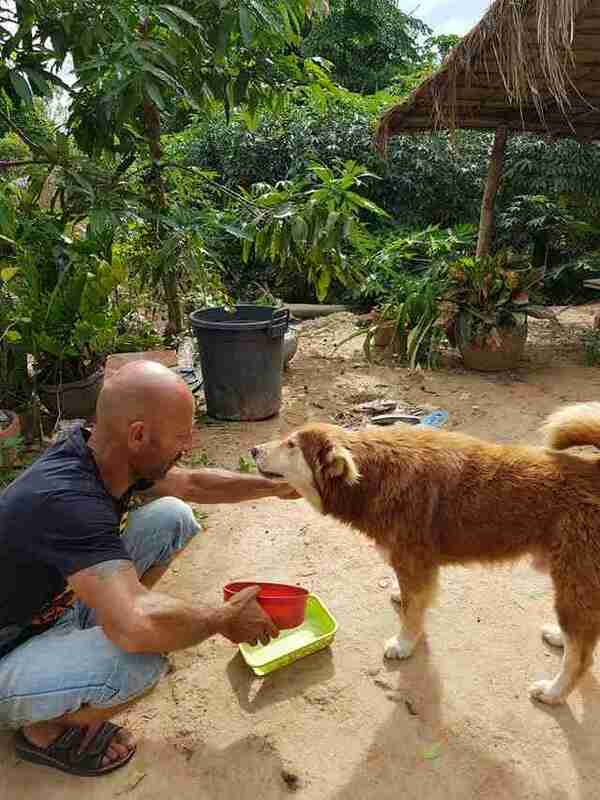 To help Chour give Tchimi and other street dogs the food and care they need, you can make a donation. You can also follow Chour’s rescue work on his Facebook page, The Sound of Animals.